I thought I would participate in a global design project challenge. 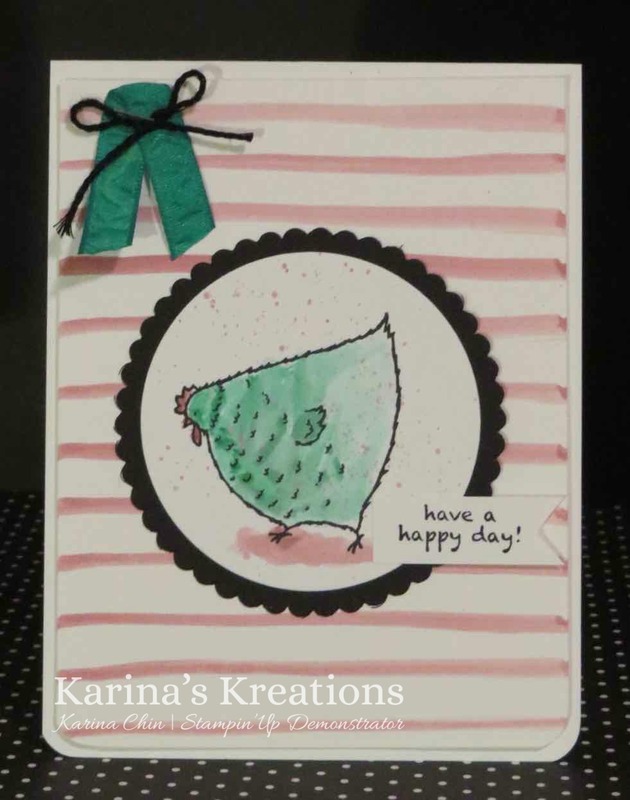 The challenge is to use Sweet Sugarplum, Emerald Envy and Basic Black on a card. I just received my pre-order box of Stampin'Up goodies and wanted to play with a new Sale-a-bration stamp set called Hey Chick. You can get this stamp set for free with a $60.00 order on Jan 4 or Dec 1 if get a starter kit from Stampin'Up. I created my own background using an aquapainter and sweet sugarplum ink. I drew the line across 4" x 5-1/4" Whisper White card stock. 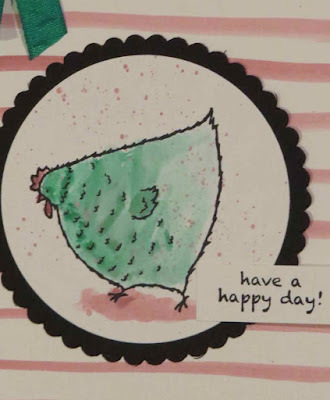 The chicken image was stamped with Black Archival ink and colored with Emerald Envy and Sweet Sugarplum ink. I added some splatters over the inage by flicking the aquapainter over the card stock. (Warning! I also splattered my desk so be able careful where you flick). The other supplies for my card are the Layering Circles Framelits #141705, Emerald Envy Ruched Ribbon #141425 and Basic Black Solid Baker's Twine #141682. I'm a Candaian demonstrator and would love to help you with your order.